← Hazel Moir, How trade agreements are locking in a broken patent system. Hazel Moir and Deborah Gleeson. Evergreening and how big pharma keeps drug prices high. Efforts by pharmaceutical companies to extend their patents cost taxpayers millions of dollars each year. In some cases they also mean people are subjected to unnecessary clinical trials. Big pharma makes big profits. Their useful new drugs are patented, protecting them from competition and allowing them to charge high prices. When the patent ends, other companies are allowed to supply the previously patented drug. These are known as generics. The prices of generic drugs are much lower than the prices of in-patent drugs – it has been suggested that for widely used drugs price falls can be as much as 95%. Pharmaceutical companies want to get their new products listed on the Pharmaceutical Benefits Scheme (PBS), because they will sell in much higher volumes. Taxpayers have an interest in ensuring that these drugs move from the high in-patent price to the much lower off-patent price as early as possible. On average, a patent provides effective protection from competition for about 14 years. But, of course, companies like monopolies and would like to extend the patent period. Over the past few decades they have used a process known as evergreening to keep generic companies out of the market for longer. Evergreening is achieved by seeking extra patents on variations of the original drug – new forms of release, new dosages, new combinations or variations, or new forms. Big pharma refers to this as “lifecycle management”. Even if the patent is dubious, the company can earn more from the higher prices than it pays in legal fees to keep the dubious patent alive. Evergreening is possible because in Australia the standard required to get a patent is very low. Different methods of delivering drugs (such as extended release, for example) have been known for decades. But when one of these known delivery methods is combined with a known drug, the patent office considers this sufficiently inventive to grant a new 20-year patent. Another favourite evergreening strategy is to patent a slight variation of the drug. Brand pharmaceutical companies argue that these “lifecycle management” patents provide improved health outcomes to the community. They meet the (very low) patentability thresholds of novelty and inventiveness. Critics argue that the claimed improved health outcomes are small or non-existent. An example is useful. In the case of the depression drug venlafaxine (marketed as Efexor), the original version had major side-effects. However, when provided in extended release form these side-effects were substantially reduced. Naturally the extended release form (Efexor-XR) became preferred. Although it might seem obvious to combine venlafaxine with an extended release form to overcome the side-effect problem, the patent office granted two new patents for extended release versions of venlafaxine. One of these was written in such a broad form that it delayed generic entry by two and a half years, while legal wrangling took place. Eventually the evergreening patent was declared invalid. But the cost to taxpayers of this delay is estimated at $209 million. 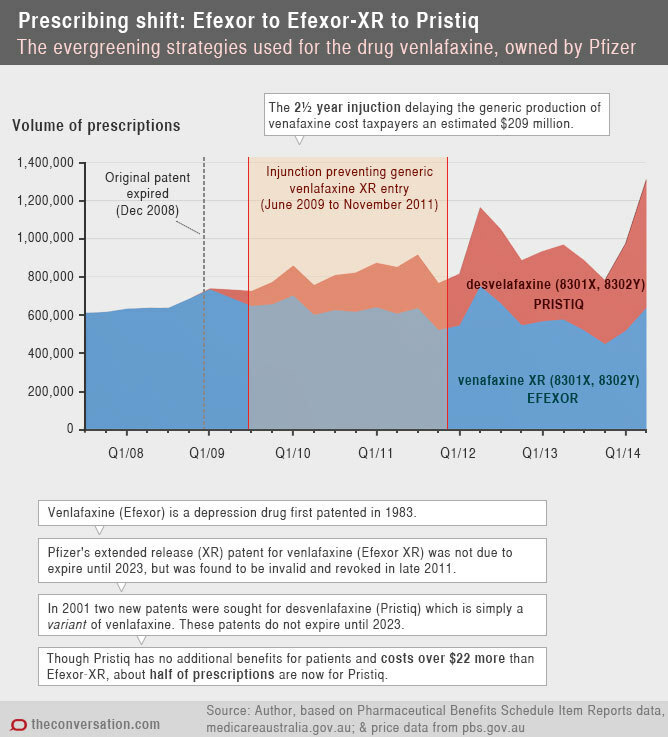 Pfizer has a second evergreening strategy for venlafaxine. When venlafaxine is taken, the human body converts it to desvenlafaxine. In other words desvenlafaxine is a variant of the original active pharmaceutical ingredient venlafaxine. Clearly the two compounds are closely related. So it is astonishing that desvenlafaxine passed the tests for getting a patent. Desvenlafaxine is marketed as Pristiq. Pristiq entered the market early in the two-and-a-half-year period of legal wrangling over the extended release venlafaxine (Efexor-XR) patent. Pfizer’s marketing of Pristiq in February 2009 was so lavish that it attracted the attention of investigative journalists. Pristiq has no additional benefits for patients. Despite this, during the first six months of 2014 half of prescriptions were written for Pristiq rather than for the clinically identical Efexor-XR. But Pristiq costs between $A22.32 and $A26.50 more than Efexor-XR, depending on the dose. Based on reported prescription volumes in 2013-14, the cost to the taxpayer of doctors prescribing Pristiq rather than Efexor-XR exceeds $21 million a year. Unless generic companies challenge the desvenlafaxine patent, there will be no generic versions of Pristiq until after August 2023, when the patent expires. Would you like a placebo with that? When such minor variations in drugs are patented and marketed, there are also ethical considerations. Pfizer had to undertake clinical trials to obtain marketing approval for Pristiq. These involved blind comparisons with placebos. Thousands of seriously depressed patients involved in these trials received placebos for no good reason, since the chemical compound was identical with the action of venlafaxine in the body. Marketing of Pristiq clearly offers few benefits to the public. It does, however, offer Pfizer the benefit of extracting additional income whenever a doctor prescribes Pristiq. Many patients suffering severe depression were subjected to a placebo in order for Pfizer to undertake the clinical trials needed to obtain marketing approval for Pristiq. There seems to be no system for protecting patients from clinical trials undertaken only to support drugs based on evergreening patents. Evergreening entails large-scale economic and social costs for Australians. Reform of our patent laws to prevent evergreening is long overdue. This should be a priority for any government interested in reducing unnecessary costs to the health system. But instead, the Trans Pacific Partnership Agreement talks expected to take place in Beijing this weekend could reinforce these problems and make reform of the patent system more difficult. Hazel Moir is Adjunct Associate Professor, economics of patents, copyright and other “IP” at Australian National University. Deb orah Gleeson is Lecturer in Public Health at La Trobe University. This article first appeared in ‘The Conversation’ on 6 November 2014. This entry was posted in Economy, Health, Politics and tagged Australian patents, big pharma, Deborah Gleeson, Efexor, Hazel Moir, The Conversation. Bookmark the permalink.